At a time when many organizations are cutting their internal auditing departments, it's imperative that every manager understands the fundamentals of internal audits. This book is designed as a corporate resource to help managers and their teams set standards for self-auditing, risk management, compliance review, and formal disclosure reporting. Readers will learn proven, effective techniques for performing reliable and defensible audit reviews to ensure compliance with regulations and standards. K.H. Spencer Pickett is a Course Director at CPMS, in Ascot, Berkshire, where he is responsible for training programmes on internal audit, corporate governance and risk management. Spencer is a member of the Chartered Association of Certified Accountants, Institute of Internal Auditors, Certified Fraud Examiners and Chartered Institute of Personnel and Development. Jennifer M. Pickett is currently a senior Project Manager in a large organization, having previously been the Business Planning and Assurance Manager responsible for coordinating the corporate risk register. Newsflash – read all about it. 2. The wider governance context. 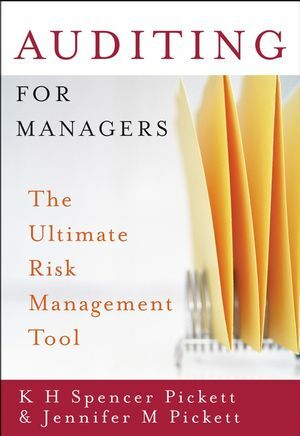 The risk management concept: roles and responsibilities. 5. The manager’s initial audit. Reports and the risk register. 6. The team’s initial audit. The team initial audit concept. 7. The manager’s initial investigation. Making sense and making good. Building on the risk concepts. Tuning into enterprise risk management. 9. Achieving the cultural shift. Change and the systems perspectives. The ultimate in risk management: auditing for all. Appendix A: Manager’s initial audits standards and guidance. Appendix B: Team initial audits standards and guidance. Appendix C: Manager’s initial investigations standards and guidance. Appendix D: Checking your progress – your score.